Connected cameras let you peek into your home while you’re away—or peek at whatever parts of your home the camera can see from its tether to an open power outlet, anyway. 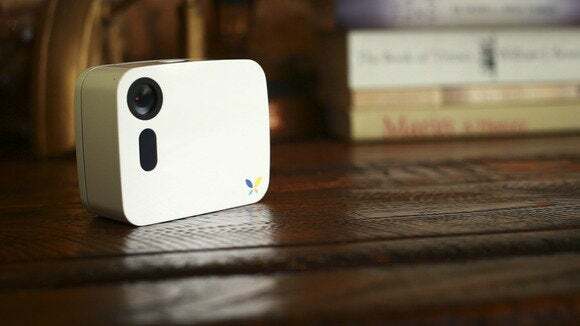 The Butterfleye is a web-connected camera with sensors, so it’s a little like the Dropcam or the Piper. But the Butterfleye is easier to move around your house since it doesn’t require AC power. Instead, it’s got a battery that recharges over USB, and company founder and CEO Ben Nader told us the software and hardware were designed to maximize battery life—Nader says you can go two weeks between charges. Butterfleye’s lack of wires means it’s easy to move around your house without needing to stick close to outlets. Place it by the front door to see what time the dog walker comes, and then move it to the kitchen the next day to find out how the cat is getting the treat cupboard open. Sensors let Butterfleye intelligently decide what to record and what not to. For instance, it’s got Wi-Fi, iBeacon, and Bluetooth, and a companion app lets you set up a geofence around your house for any number of Android and iOS smartphones. When your phone is within the geofence, Butterfleye thinks you’re home, and it stops recording you. It can also sense ambient light, heat, and infrared waves, which help it determine if it’s seeing a human being or pet (which it will record) or just your TV left on (which it can ignore). Besides halting recording when you’re at home, Butterfleye takes your security seriously by using encryption when sending video from the device to the cloud. You get 24 hours of video storage for free, with bigger plans for 7 or 30 days, and you can stream live video for free anytime. The Butterfleye device can store 12 hours of video internally, and if your Wi-Fi blips out when Butterfleye is recording, it can even go back and repush the missing video to the cloud when your network comes back online. If you actually want the Butterfleye to record while you’re home, a single button on the device enables “moments mode,” which records HD (1920x1080p) video, and also pulls out JPG stills when it recognizes faces. Because of the long battery life and onboard storage, you could take Butterfleye outside, and get candid shots of your picnic in the park. For now you can only access Butterfleye’s videos and photos from the iOS app, but the company plans to release an Android app as well. Nader’s vision features Butterfleye as a smart home hub. Although it won’t do this at launch, Butterfleye could connect to Bluetooth Smart devices like your Jambox, Nest thermostat, and smart lightbulbs. Since the Butterfleye has a persistent connection to your Wi-Fi network, you could check in on those Bluetooth devices even when you’re out of range, and set up actions like having your lights flicker on and your thermostat turn up as you approach your house. Updated on August 27, 2014 with a video report from IDG News Service.